‘Here come two Fredericks to visit a third’. These were the words delivered by Frederick IV King of Denmark to Frederick I King in Prussia as he alighted from his carriage in Potsdam in July of 1709. The Danish king was joined on this momentous occasion by king Augustus (Frederick-Augustus). The meeting of these three kings would later come to be known as the Dreikönigstreffen, or meeting of the three kings. A number of pieces of art were created to commemorate this historic royal gathering. The most striking of these is a pair of paintings that symbolically depicts the Dreikönigstreffen and all it was thought to represent. One of these paintings in particular has a remarkable historical tale to tell, having made its way from Berlin to England, from there to New York, and once more back to Germany, where it today resides in Schloss Caputh on the edge of Potsdam. The painting is now in the possession of Die Freunde der Preußischen Schlösser und Gärten e. V., however previous owners have included a British ambassador and the artist Andy Warhol amongst others. Moreover the painting is significant because its mere existence points to the importance of Anglo-Prussian relations during the reign of the first king in Prussia. Both British and Prussian actors could instrumentalise this relationship in order to produce their elevated status, and the tale of British involvement in the Dreikönigstreffen is an interesting demonstration of this. The meeting between the three kings that took place in Berlin and Potsdam came as a direct consequence of a similar meeting that occurred one month prior. Here the King of Denmark had upon his return journey from Venice decided to visit his cousin king Augustus, who was also Elector of Saxony. The Danish king was hosted magnificently during his month long stay in Dresden and an impressive array of festivities were organised in his honour. 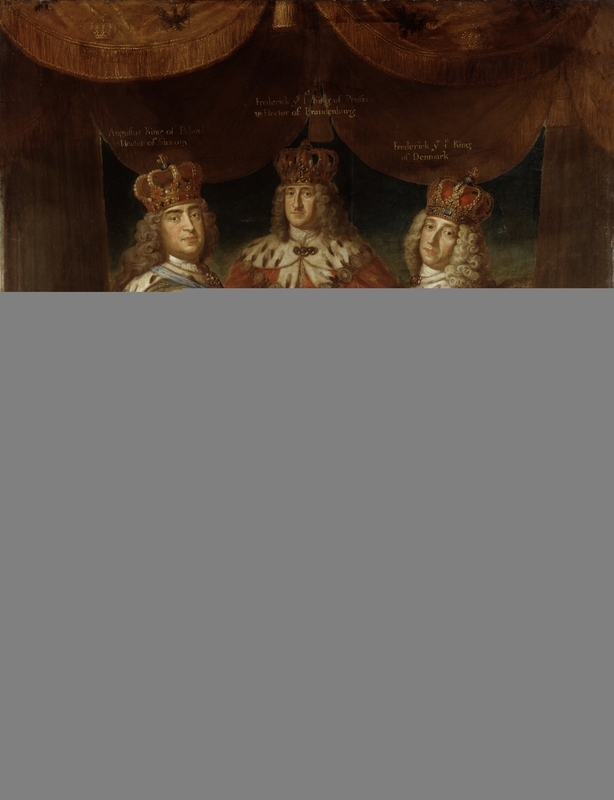 During this sojourn the two kings also signed a military alliance; for each had previously been a belligerent in the Great Northern War (1700-1721), but had been forced to sue for peace after suffering crushing defeats at the hands of the Swedish king Charles XII. However, in light of the gradually weakening position of the Swedish king, the two resolved in 1709 to re-enter the war and make good their losses. A primary objective was to regain Augustus’ Polish throne, from which Charles had deposed him in 1706. The pair were desirous to avoid their piecemeal destruction, as had been the case in the preceding years. They consequently set out to incorporate further allies into their anti-Swedish coalition. Frederick I King in Prussia stood out as a prime candidate due to his proximity to the Swedish Empire and significant military resources. Frederick IV and Augustus thus arrived in Frederick I’s territories on the 2nd of July 1709 and were hosted there for the next two weeks. The various court occasions that ensued were coupled with political negotiations designed to integrate Frederick I into an offensive anti-Swedish coalition. The magnificent painting: Allianzbildnis der Könige Friedrich I. in Preußen, August II. von Polen und Friedrich IV. von Dänemark depicts an idealised vision of the meeting of the three kings. In it, the aforementioned kings are symbolically depicted in fraternity, unity and equality. The clasping of hands suggests the unity of purpose that was supposed to have stemmed from the meeting, and the anti-Swedish alliance that was concluded there. This is somewhat misleading as the King in Prussia only entered into a defensive rather than an offensive alliance against the Swedish king. The royal credentials of the kings are emphasised, with each depicted in full royal garb, with crown atop head, and bedecked with the orders instituted by their royal houses. Emphasis is placed upon the lofty royal status of each king, not least by their position under a baldachin decorated with royal insignia, as well as the crowns exhibited on their cloaks. Despite the emphasis of each of their individual statuses, they are simultaneously depicted as equal to their peers, standing equally upon one of the three points of a triangle. The symbolism and intended political message of the image could not be clearer. Despite the recent creation of the Prussian royal title, the first King in Prussia is shown as the equal of longer reigning monarchs of long-established crowns. 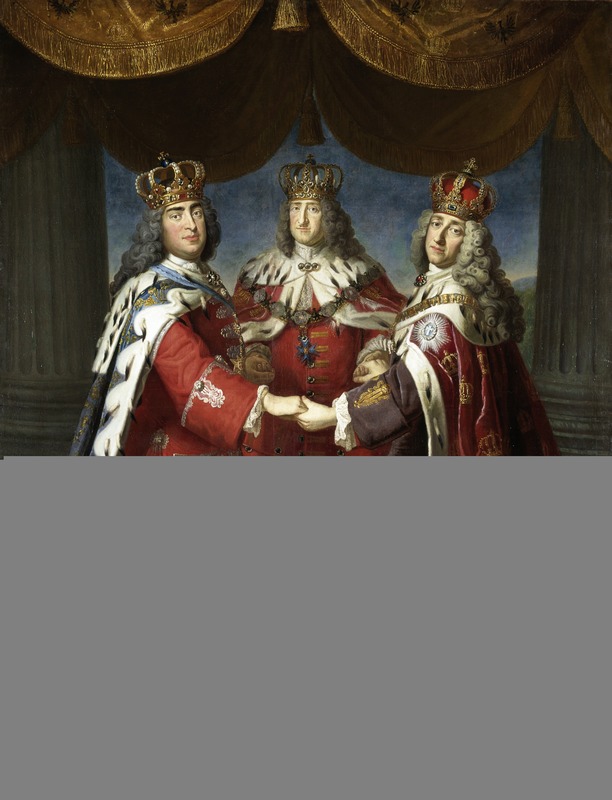 The painting therefore consciously asserts Frederick I’s supposed acceptance into the group of European monarchs, and is part of a larger process of Prussian self-representation that occurred after the coronation of 1701. The Dreikönigsporträt (portrait of the three kings) itself is attributed to the Spandau born artist Samuel Theodor Gericke. Gericke was often patronised by Frederick I; as early as 1696 he appointed him court painter, and subsequently professor at the recently established royal-Prussian academy of arts. Gericke would have been aware of the self-conscious attempts Frederick I had made from 1701 onwards to communicate his royal status. The painting produced can therefore be seen to have been influenced by the desires of the Prussian king and his ministers, if not explicitly painted at their direction. The image fits into a larger process of monarchical self-representation undertaken by the king in Prussia. Gericke produced the Dreikönigsporträt in 1709, to mark the visit of the two foreign kings to Potsdam, Oranienburg, Charlottenburg and Berlin. From the eighteenth century onwards the painting was prominently displayed in Schloss Charlottenburg, where the kings were lodged on the 11th of July. In the period after 1945 the painting appeared to have been lost, but today it is once more accessible to visitors of Schloss Charlottenburg. The painting that sits in Schloss Charlottenburg was not the only copy commissioned. Versions of the painting were also produced for the visiting kings. However very little is known of their current whereabouts or historical utilisation. The copy given to king Augustus last appeared in an inventory of paintings in Dresden in the 1720s, but since appears to have been lost. Even less is known about any version given to the Danish king. It is highly likely that in the intervening years these paintings have either been misplaced or destroyed. The three participating kings were not the only actors to receive a painting to commemorate their role in the occasion. A further copy of the Dreikönigsporträt was commissioned for the British ambassador to mark the significant role he had played during the meeting of the three kings. The history of this painting is curious in itself. Moreover, its bestowal points to larger trends in Anglo-Prussian relations during the reign of Frederick I. The version owned by the British ambassador, Thomas Wentworth, Baron Raby also appears to have been produced by Gericke. It would seem this painting was commissioned by Frederick I and given to Raby as a gift. Not least because an English inscription in the lower left-hand corner states as much. There is however still some debate amongst historians over whether the British ambassador could have commissioned the copy himself. The copy given to Raby contains a number of minor differences to the one retained by the Prussian king. The garments of Frederick I possess an additional button, but more significantly the Prussian king’s central position is emphasised more, and he is depicted as slightly larger than in the original. His crown is raised above those of both Augustus and Frederick IV This is of course partly due to perspective, as Frederick I stands at the upper end of the triangle. Despite his raised position Frederick is still (accurately) depicted as shorter than Augustus for example, who stood at the unusually tall height of 176cm. Raby’s Berlin embassy came to an end in 1711 when he received a significant career promotion. In that year he was elevated to the Earldom of Strafford, as well as being appointed British ambassador extraordinary to the Dutch Republic and Plenipotentiary at the Utrecht peace congress. From 1711 until 1713 he negotiated the peace that concluded Britain’s involvement in the War of the Spanish Succession. It is unclear whether the Dreikönigsporträt followed him to the Netherlands. 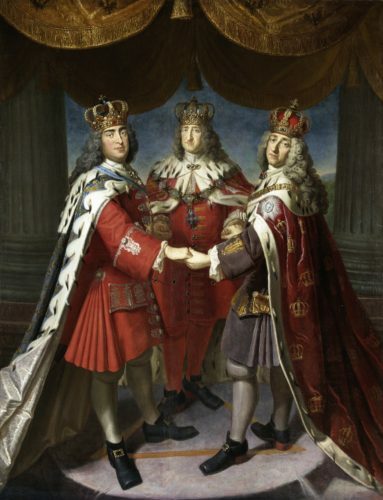 However, by 1724 the triple portrait had reappeared in England. In 1708 Raby had purchased an estate in Yorkshire and thereafter began to construct a large residence there. It was here, at his new country seat, Wentworth Castle, that the likeness of the three kings was prominently displayed. It took its place in the long gallery next to an equestrian portrait of Lord Raby himself (now Earl of Strafford). Raby utilised art and architecture at Wentworth Castle to exhibit his cultivation and good taste, as well as to demonstrate his political importance and the high regard in which the Berlin court had held him. This became all the more imperative after 1714, for after the Hanoverian succession impeachment proceedings were commenced against Raby for his role in concluding the peace of Utrecht. Raby was pardoned in 1717, but by that point he had already been deprived of many of his offices and been driven from court. At some point, likely after Strafford’s death in 1739, an English inscription was added to the painting. It contains a few notable errors. It describes Frederick as King ‘of’ Prussia for example. Most noticeably it states that the painting was given to Raby when the three kings dined with him in ‘Anno Dom: 1705’, though the actual meeting took place in 1709. These errors would suggest that the text was not appended in Raby’s lifetime. Hosting three kings in one’s house was not an everyday occurrence, and Raby can hardly be expected to have forgotten the year in which this occurred. The painting of the three kings remained on display at Wentworth Castle until the twentieth century. The Wentworth family encountered financial difficulties and correspondingly sold off around 2,000 items on site in 1948. The image of the three kings was included within this auction and was bought by the collector Sir David Piper. It was at this juncture the painting was separated from the magnificent frame in which it had originally been set. Ownership of the painting then passed through many hands. The renowned artist Andy Warhol was, amongst others, one of those to possess the picture in his own collection. He supposedly affectionately referred to the image as ‘my dancing kings’, incorrectly ascribing dancing to the clasped hands of unity and equality. In 1991 the Freunde der Preußischen Schlösser und Gärten was offered the opportunity to purchase the painting, and in 1994 paid the very reasonable price of $80,000 or 126,830 DM to acquire it. The Dreikönigsporträt was then loaned by the Friends to Schloss Caputh on the edge of Potsdam. Here it sits to this day, where anyone who wishes to view it may do so as part of an excursion to this charming Lustschloss. 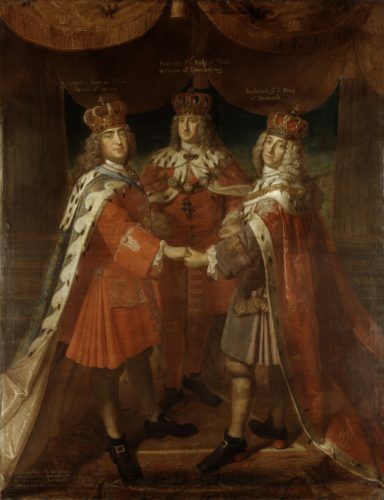 It is quite appropriate that the painting should find a home in Schloss Caputh, as it was here on the 8th of July 1709 that the three kings travelled to conduct further negotiations on Frederick’s prospective entry to the anti-Swedish coalition. Talks were undertaken but not successfully concluded. Nonetheless this did not impede the three kings from descending into a round of merry drinking at the arranged lunch in Caputh. A contemporary observer noted that there was excessive drinking so that ‘king Augustus became very drunk’, and even, that one of his ministers in a moment of drunken stupor fell flat on his face. It is not merely the journey that Raby’s version of the Dreikönigsporträt has undertaken that is of historical interest. Perhaps more fascinating is what the image represents. Despite not being depicted in the painting, the very fact that Raby possessed a copy is instructive. It points to the significant role the British ambassador played during the meeting of 1709, and the way in which Anglo-Prussian relations could reciprocally produce the elevated status of participant actors. Raby hoped to use his diplomatic posting in Prussia to facilitate his own rank elevation. Within hierarchically ordered noble-aristocratic society many hoped to improve their position. Alongside this, Raby’s personal desire for advancement stemmed specifically from his ‘sense of disinheritance’. In 1695 he was deprived of the ancestral Wentworth estates and ‘only’ inherited the title of Baron. This contributed towards his aspiration to gain the Earldom he felt was rightfully his. Raby hoped that dutiful and useful diplomatic service could secure for him such advancement, alongside prestige and other forms of remuneration. In the form of his monarch (Queen Anne, r. 1702-1714) there was an arbiter from whom Raby could secure such bounties. To do so he merely had to prove his utility in serving her interests abroad. For Raby in the period of the War of the Spanish Succession this meant keeping Prussia in the anti-French grand alliance, and keeping Frederick’s troops at the alliance’s disposal. Showing his close relationship to the King in Prussia allowed Raby to demonstrate his ability to do this. While the foreign kings were restricting Frederick I’s ability to produce his royal status, the representative of the British monarch proved a far more useful tool through which Frederick was able to assert his rank. That man, the aforementioned Baron Raby, had been elevated to extraordinary ambassador in 1705. This was significant, for contemporaries widely accepted that ambassadors were only sent to kings and those who had successfully constructed their sovereign status. Frederick himself had agitated for quite some time that the British send an ambassador to his court. Moreover the British were parsimonious in awarding ambassadors. During the combined reigns of William III and Anne (1688-1714) only 34 men were appointed to the rank. What is more, during this period not a single English or British ambassador was dispatched either to Frederick IV of Denmark, or Augustus as ruler of Saxony-Poland. They were therefore both aware of the significant coup it was to secure a high ranking British diplomat, and the tacit recognition of Frederick’s kingship that Raby’s presence embodied. Raby’s legitimating presence was consequently utilised on three key occasions during the course of the Dreikönigstreffen. The first of these was the christening of crown princess Wilhelmine that occurred as part of the Dreikönigstreffen on the 12th of July 1709. The two visiting kings stood atop the altar in the chapel within the Berliner Schloss in order to assume the role of godparents. Here, they gazed back upon the assembled congregation gathered within the tightly packed chapel. Besides the retinues of the three kings only three further actors were present; Raby, as well as the envoys from the United Provinces and Russia. The differences in rank between the three additional witnesses was markedly emphasised. Raby’s superior ambassadorial rank was spatially communicated to the two kings, as he was seated alone on a separate bench in front of both of the other envoys. This arrangement, combined with the generally acknowledged fiction that ambassadors possessed a representative character, and thus represented the person of their sovereign, contributed to the message being communicated. Frederick was attempting to assert his royal rank before the two visiting kings by showing that the British Queen had accepted his royal pretensions by sending him an ambassador. The next instance at which Raby’s presence was used to aid in the production of Frederick’s status as king occurred around midday on the 15th of July. This was to be the penultimate day of the Dreikönigstreffen, and it was then that the three kings came to Raby’s residence in the Breite Straße to take lunch. In his role as host, Frederick I had been forced throughout the course of the Dreikönigstreffen to grant precedence and the associated ceremonial honours to both Frederick IV and Augustus consecutively. One such honour was the right to take the ceremonially most prestigious place at banqueting tables. Frederick’s Master of Ceremonies, Johann von Besser, however successfully argued that the residence of the British ambassador should be considered a ‘third place’. Thus, at the ambassadorial residence the King in Prussia also occupied the role of guest alongside the two visiting kings. In order to resolve matters pertaining to precedence the three kings consequently drew lots for their places at Raby’s table. Serendipitously Frederick I and his queen secured the ceremonially most prestigious place. Until that point Frederick had been successively forced to concede this place to one of the two visiting kings. Yet within the residence of the British ambassador he was able to secure this honour for himself. Doing so communicated his equal rank as king. Frederick I was able to take precedence over the two other kings, just as they had taken precedence over him. Frederick’s place at the luncheon table was thus an affirmation of his royal equality in the world of early modern ceremonial. Throughout the Dreikönigstreffen Frederick I had sought to produce his royal status by showing off the wealth and splendour of his newly royal court. Conspicuous consumption demonstrated to observers that element of majesty that was regarded as an essential component of royal status. Frederick’s opportunities to demonstrate his kingly status through grandeur and magnificence were however severely limited by the visiting kings. They specifically requested that Frederick do away with ceremony and splendour as much as possible. The King in Prussia nonetheless still sought to utilise those limited opportunities that were available to him. The luncheon at the British ambassador’s residence was one such opportunity. Frederick had sought to display the magnificence abundant within his territories throughout the stay of the two kings, and Raby’s embassy was part of this landscape of magnificence. British ambassadors were awarded a whole host of splendid objects for their time abroad. Most notable were the allowances of 167kg of white plate and 30kg of gilt plate. Raby had these fashioned into a magnificent dining set, with the most prominent piece undoubtedly ‘one large [silver] cistern, curiously enchased and curled with lions heads at each end’. These objects would have been utilised by the three kings during the luncheon hosted at the British embassy. Frederick was therefore able to project his kingly status through the splendour of Raby’s residence. For it was only by becoming king that Frederick had been able to secure a British ambassador at his court, and by extension the corresponding material magnificence that accompanied such an appointment. This would have been apparent to the visiting kings, for the lower ranking British envoys that had frequented their courts did not possess such a magnificent range of status linked objects. On these three key instances Prussian actors were able to utilise the presence of a British ambassador to communicate Frederick’s claim to a position in the circle of crowned heads. Thus, while throughout the Dreikönigstreffen the two visiting kings did all they could to limit Frederick’s political instrumentalisation of the occasion, the King in Prussia was nevertheless able to effectively utilise his relations with the British ambassador to contribute towards the ongoing process of producing his status as king. Raby was not an exploited tool, but a willing collaborator; he too hoped to gain from the Dreikönigstreffen. The visit of three kings to his residence undoubtedly conferred prestige upon him, as did his prominent position alongside the baptismal proceedings. Moreover, the visit of the two kings allowed Raby to regain some of his former importance. His position had been severely undermined in 1706, and thereafter he was gradually excluded from Anglo-Prussian political correspondence. Yet in July of 1709 he exercised influence over Frederick’s policy towards the Great Northern War. He defended the interest of the Maritime powers, and in conjunction with Prussian ministers succeeded in halting a Prussian foray into the Great Northern War. Likewise, he used the Dreikönigstreffen to obtain assurances from Denmark and Saxony that any move against Sweden would not be prejudicial to Queen Anne’s interests, and would not result in the recall of their troops from allied service. It is perhaps unsurprising that the two surviving copies of the Dreikönigsporträt, belonged to the two men who hoped to enhance their status through proceedings. The Prussian king, who sought to utilise the occasion to assert his royal credentials and equality to other crowned heads, and the British ambassador, who sought to communicate his political importance both to the Berlin court and to British political elites in order to secure his own advancement. Those copies of Gericke’s work that were gifted, but were not so proudly displayed and ultimately lost, belonged to the two actors for whom the meeting was least beneficial. Frederick IV and Augustus sought to limit the ceremonial aspect of the meeting and incorporate Frederick I into an offensive anti-Swedish coalition. They ultimately failed. The painting that today sits in Schloss Caputh therefore signifies the importance of Anglo-Prussian relations during the reign of Frederick I and particularly during the Dreikönigstreffen. Through this relationship Frederick and Raby were able to reciprocally construct their elevated status. Even during the Dreikönigstreffen, with two foreign kings present in Brandenburg-Prussia the utility of Anglo-Prussian relations in this regard could not be outshone. What is more this mutual status production had brought about noticeable results for both sides. By 1713 the royal rank of the Hohenzollern dynasty was almost universally accepted, in no small part thanks to a decade of Anglo-Prussian collaboration that allowed Frederick to construct such a status. Raby meanwhile had proved his utility in Berlin and managed to secure promotion to the rank of Earl, ambassador and plenipotentiary. He was also inducted into the Order of the Garter, secured for himself a position on the privy council and became first Lord of the Admiralty. The Dreikönigstreffen is therefore one instance illustrative of a process of the reciprocal production of status that was prevalent throughout Anglo-Prussian relations during the reign of Fredrick I. Reported by the Mecklenburg envoy, quoted in V. Czech, Das Potsdamer Dreikönigstreffen im Jahr 1709: Möglichkeiten und Grenzen höfisch-dynastischer Selbstdarstellung in Brandenburg-Preußen (Göttingen: Cuvillier, 2008), p. 50. Frederick Augustus had ruled the Electorate of Saxony from 1694. In 1697 he was elected King of Poland and adopted the regnal title of Augustus II. In 1706 Augustus was deposed from his Polish throne. He was allowed to retain the royal dignity and henceforth styled himself as merely ‘King Augustus’. He regained the royal title in August of 1709. Czech, Das Potsdamer Dreikönigstreffen, pp. 82-94. The Friends of the Prussian Palaces and Gardens. Frederick IV had been in Venice for carnival. The Danish king and Augustus were quite literally cousins, sharing Frederick III of Denmark as their grandfather. J. C. Lünig, Theatrum Ceremoniale Historico-Politicum, Oder Historisch- Und Politischer Schau-Platz Aller Ceremonien, Welche so Wohl an Europäischen Höfen als auch Sonsten bey Vielen Illustren Fällen Beobachtet Worden, Vol. 1 (Leipzig: Weidmann, 1719), pp. 209-211; Czech, Das Potsdamer Dreikönigstreffen, pp. 29-33. R. Frost, The Northern Wars: War, State and Society in Northeastern Europe, 1558–1721 (Harlow: Longman, 2000), pp. 229-230. P. Wilson, German Armies: War and German Society, 1648-1806, (London: UCL Press, 1998), p. 137. The Prussian army had a strength of around 44,000 troops in 1709; M. Braubach, die Bedeutung der Subsidien für die Politik im spanischen Erbfolgekriege (Bonn: Schroeder, 1923), p. 124. V. Loewe, Preussens Staatsverträge aus der Regierungszeit König Friedrichs I. (Leipzig: S. Hirzel, 1923), p. 107. The orders of the Elephant, Black Eagle, and White Eagle respectively. It is of course unlikely the three kings actually met in these clothes, Czech, Das Potsdamer Dreikönigstreffen, p. 83. This is the case for Frederick IV and Frederick I the crown is notably absent on the floral design of Augustus’ cloak. See: B. Stollberg-Rilinger, “Höfische Öffentlichkeit: zur zeremoniellen Selbstdarstellung des brandenburgischen Hofes vor dem europäischen Publikum” Forschungen zur brandenburgischen und preußischen Geschichte, Vol. 7, No. 2 (1997), pp. 145-176. It was earlier thought to have been completed by Friedrich Wilhelm Weidemann. Czech has called it: ‘without [a] doubt a revealing example of Prussian self-representation’, Czech, Das Potsdamer Dreikönigstreffen, p. 83. F. Nicolai, Beschreibung der Königlichen Residenzstädte Berlin und Potsdam und aller daselbst befindlicher Merkwürdigkeiten (Berlin: 1779), Vol. 2, p. 766. Freunde der Preußischen Schlösser und Gärten, Anlage 1 zum Antrag auf Gewährung einer Zuwendung aus Überschüssen der DKLB, 8.10.1993. Czech, Das Potsdamer Dreikönigstreffen, pp. 83-86. Czech, Das Potsdamer Dreikönigstreffen, p. 86. M. Charlesworth, “Lord Raby in Berlin: Art, Architecture and Armour” in P. Eyres & J. Lomax (eds. ), Diplomats, Goldsmiths and Baroque Court Culture: Lord Raby in Berlin, The Hague and at Wentworth Castle, 1701-1739 (Barnsley: Wentworth Castle Heritage Trust, 2014), p. 35. Czech, Das Potsdamer Dreikönigstreffen, p. 83; P. Eyres, “Lord Raby’s Embassies and their Representation at Wentworth Castle” in P. Eyres & J. Lomax (eds. ), Diplomats, Goldsmiths and Baroque Court Culture: Lord Raby in Berlin, The Hague and at Wentworth Castle, 1701-1739 (Barnsley: Wentworth Castle Heritage Trust, 2014), p.52; A. Bauer, “Samuel Theodor Gericke, Allianzbild der Könige Friedrich I. in Preußen, August II. von Polen, und Friedrich IV. von Dänemark”, in Fördern, Erwerben, Restaurieren. 35 Jahre Engagement der Freunde der Preußischen Schlösser und Gärten e.V., Freunde der Preußischen Schlösser und Gärten (ed.) (Berlin: 2018), p. 208. ‘Given by these Kings to Thomas: Earl of Strafford on their haveing all three dined togather with him when Lord Raby Ambassador Extraordinary at Berlin’. Alfred Hagemann has suggested that Raby commissioned Gericke himself to make a copy and that it was therefore no gift in recognition of his services. This would not be out of keeping with the character of Lord Raby. A. Hagemann, “Lord Raby and the Cultural Milieu of the Berlin Court of Frederick I.” in P. Eyres & J. Lomax (eds. ), Diplomats, Goldsmiths and Baroque Court Culture: Lord Raby in Berlin, The Hague and at Wentworth Castle, 1701-1739 (Barnsley: Wentworth Castle Heritage Trust, 2014), p. 19. This, in combination with his 120kg weight earned him the sobriquet ‘Augustus the Strong’. T. Sharp, Pleasure and Ambition: The Life, Loves and Wars of Augustus the Strong (London: Tauris, 2001), p. 278. U. Naujokat, “Mylord Raby: Ein englischer Lebemann als Diplomat am Hofe Friedrichs I.”, in Preußen und Preußentum vom 17. Jahrhundert bis zur Gegenwart, Ernst Opgenoorth et. al. (eds.) (Berlin: Verlag Spitz, 2002), pp. 87-89. Eyres is also unsure whether the painting was ever displayed in Raby’s London house, 5 St James’s Square. Eyres, Lord Raby’s Embassies and their Representation at Wentworth Castle, p. 58. An anonymous visitor noted in 1724 that the triple portrait hung in the [Long] Gallery, Eyres, Lord Raby’s Embassies and their Representation at Wentworth Castle, p. 63. P. Eyres & J. Lomax (eds. ), Diplomats, Goldsmiths and Baroque Court Culture: Lord Raby in Berlin, The Hague and at Wentworth Castle, 1701-1739 (Barnsley: Wentworth Castle Heritage Trust, 2014), p. 4; Hagemann, Lord Raby and the Cultural Milieu of the Berlin Court, p. 17. It originally hung in the long gallery but was later moved to the great hall. A photograph of the painting hanging next to Raby’s equestrian portrait is in P. Eyres & J. Lomax (eds. ), Diplomats, Goldsmiths and Baroque Court Culture: Lord Raby in Berlin, The Hague and at Wentworth Castle, 1701-1739 (Barnsley: Wentworth Castle Heritage Trust, 2014), p. 42. Hagemann, Lord Raby and the Cultural Milieu of the Berlin Court, pp. 9-22. Naujokat, Mylord Raby, p. 91. Eyres & Lomax, Introduction, p.3; Naujokat, Mylord Raby, p. 91. 1711 is the earliest the inscription can possibly have been added, for it refers to Raby as the Earl of Strafford and he acquired the title in that year. He was of course King in Prussia. Frederick II would be the first Hohenzollern King of Prussia. Though this is a common mistake, particularly in English literature. K. Friedrich, and S. Smart, The Cultivation of Monarchy and the Rise of Berlin: Brandenburg-Prussia, 1700. (Farnham: Ashgate, 2010), p. 16. See: P. Eyres & J. Lomax (eds. ), Diplomats, Goldsmiths and Baroque Court Culture: Lord Raby in Berlin, The Hague and at Wentworth Castle, 1701-1739 (Barnsley: Wentworth Castle Heritage Trust, 2014), p. 42. From a note from the inventory of Schloss Caputh given to the author by Milko Jovic. Czech, Das Potsdamer Dreikönigstreffen, p. 83; Charlesworth, Lord Raby in Berlin: Art, Architecture and Armour, p. 35; Bauer, Samuel Theodor Gericke, Allianzbild der Könige, p. 208. Charlesworth, Lord Raby in Berlin: Art, Architecture and Armour, p. 35. Though he was not the first to make this mistake; an English travel account of 1802 made the same error: ‘a curious picture containing three crowned personages…and dancing’, Mitteilungen der Freunde der Preußischen Schlösser und Gärten e. V., Vol. 9, (1994). From the report of Bartsch, the envoy from Saxe-Gotha-Altenburg, reproduced in Czech, Das Potsdamer Dreikönigstreffen, p. 147. P. Eyres & J. Lomax (eds. ), Diplomats, Goldsmiths and Baroque Court Culture: Lord Raby in Berlin, The Hague and at Wentworth Castle, 1701-1739 (Barnsley: Wentworth Castle Heritage Trust, 2014), p. 4. J. Cartwright, The Wentworth Papers: 1705-1739, Selected from the Private and Family Correspondence of Thomas Wentworth, Lord Raby (London: Wyman, 1883), pp. 21-22. The Prussian army had a strength of around 44,000 men in 1709, of which 31,000 were in the service of the allies; Braubach, Die Bedeutung der Subsidien, p. 124. Czech, Das Potsdamer Dreikönigstreffen, pp. 17-24. They requested there be no solemn ceremonial entry to either Potsdam or Berlin, and also sought to reduce the ceremony surrounding evening banquets. The Present State of Europe: Or the historical and political monthly Mercury, Vol. 20, July 1709 (London: 1709), p. 210; Besser, Schriften: Ergänzende Texte, Vol. 4, p. 363; Czech, Das Potsdamer Dreikönigstreffen, pp. 35-39, 70. His ambassadorial entry would not take place until April 1706. Stollberg-Rilinger, Höfische Öffentlichkeit. J. Howell, A Discourse Concerning the Precedency of Kings (London: 1664), p. 185; A. Wicquefort, The Embassador and his Functions, J. Digby (Trans.) (London: 1716), pp. 44-46. Raby to Harley, 12.07.1704, TNA, SP 90/2. W. Roosen, “Early Modern Diplomatic Ceremonial: A Systems Approach” The Journal of Modern History, Vol. 52, No. 3 (1980), p. 6. D. B. Horn, The British Diplomatic Service: 1689-1789. (Oxford: Clarendon Press, 1961), p. 44. D. B. Horn, British Diplomatic Representatives: 1689-1789 (London: Royal Historical Society, 1932), pp. 1-3, 63-64, 86-87. Besser, Schriften: Ergänzende Texte, Vol. 4, pp. 369-371. Besser, Schriften: Ergänzende Texte, Vol. 4, p. 370. Lünig, Theatrum Ceremoniale, Vol. 1, p. 368; Stollberg-Rilinger, Höfische Öffentlichkeit, p. 153. It should be noted that this was a noteworthy occasion. The three kings did not dine with any other foreign diplomats. Besides Frederick and Raby, the two visiting kings were also hosted by Wartensleben and Wartenberg. Czech, Das Potsdamer Dreikönigstreffen. Precedence rotated between the two kings on a daily basis. The document which regulated this is reproduced in: Czech, Das Potsdamer Dreikönigstreffen, pp. 118-119. Besser, Schriften: Ergänzende Texte, Vol. 4, pp. 371-374. Raby presented them with an ‘Indian basket’ from which they drew lots, Besser, Schriften: Ergänzende Texte, Vol. 4, pp. 373. Frederick and his queen sat on the long side of the oval table, in the middle of the four monarchs that occupied that side of the table. They sat next to the fireplace facing the door. While Frederick himself sat to the right of his queen in the place of precedence. Czech, Das Potsdamer Dreikönigstreffen, p. 78; Besser, Schriften: Ergänzende Texte, Vol. 4, p. 374. That this was the place of precedence see: U. Löwenstein, “Vom Tafelzeremoniell” in K. Bußmann, F. Matzner, U. Schulze (eds.) Johannn Conrad Schlaun, 1695-1773: Architektur des Spätbarock in Europa (Stuttgart: Oktagon, 1995), p. 554. Czech, Das Potsdamer Dreikönigstreffen, pp. 42, 102, 148. The entry to Berlin was a particular example of this as the kings declined a ceremonial entry and solemnities for the occasion. H. Jacobsen, Luxury and Power: The Material World of the Stuart diplomat 1660-1714 (Oxford: OUP, 2012), pp. 13-36. Jacobsen, Luxury and Power, pp.14; J. Lomax, “The Ambassador’s Plate Revisited” in P. Eyres & J. Lomax (eds. ), Diplomats, Goldsmiths and Baroque Court Culture: Lord Raby in Berlin, The Hague and at Wentworth Castle, 1701-1739 (Barnsley: Wentworth Castle Heritage Trust, 2014), pp. 66-67. Lomax, The Ambassador’s Plate Revisited, p.69. An extensive list of the ambassadorial plate collection can be seen in: TNA, LC 9/47, ff. 68-71. Until the Tory political triumph of 1710 brought him significant influence back in Britain. For his post 1706 fall from grace see: M. Pohlig, Marlboroughs Geheimnis: Strukturen und Funktionen der Informationsgewinnung im spanischen Erbfolgekrieg (Cologne: Böhlau Verlag, 2016), pp. 226-232; L. Frey, Anglo-Prussian Relations, 1703-1708: Thomas Wentworth, Baron Raby’s Mission to Berlin, Ph.D. diss., (Ohio State University, 1971), pp. 89-90; Raby to Cadogan 09.03.1709, BL, ADD. MS. 22196. For more on the 1706 crisis see: C. Matthews, The Production of Royal Rank through Ambassadorial Presence: Frederick I. and the Utilisation of Anglo-Prussian Relations, in: Texte des RECS #8, 31/07/2017, https://recs.hypotheses.org/1520. Raby to Boyle, 20.07.1709, TNA, SP 90/5. Naujokat, Mylord Raby, p. 89; A. Collins, The Peerage of England: Containing A Genealogical and Historical Account of all the Peers of England, Vol. 3, (London: 1741), pp. 89-92. Diesen Artikel zitieren: Crawford Matthews, Dreikönigsporträt, in: Texte des RECS #27, 11/12/2018, https://recs.hypotheses.org/4022. Dieser Eintrag wurde veröffentlicht in T-RECS und verschlagwortet mit August der Starke, August II. (Polen), Caputh, Diplomatiegeschichte, Friedrich III./I., Friedrich IV. von Dänemark, Polen, Preußen, Sachsen, Schloss Charlottenburg, Zeremonialgeschichte, Zeremoniell von Truc Vu Minh. Permanenter Link zum Eintrag.